For the first time nearly 20 years, a new video on best practices for bunkering operations (the transfer of fuel to a vessel) has been released. 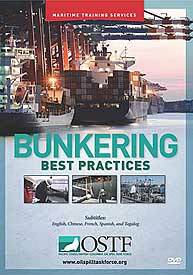 Entitled Bunkering Best Practices: Protecting People and the Environment, the 14-minute training video is the result of cooperative efforts from members of the Pacific States/British Columbia Oil Spill Task Force and Maritime Training Services in Seattle. You can view or download the videos and read the press release by selecting from the links below.